← 69. Moray New. 24th Oct 2017. 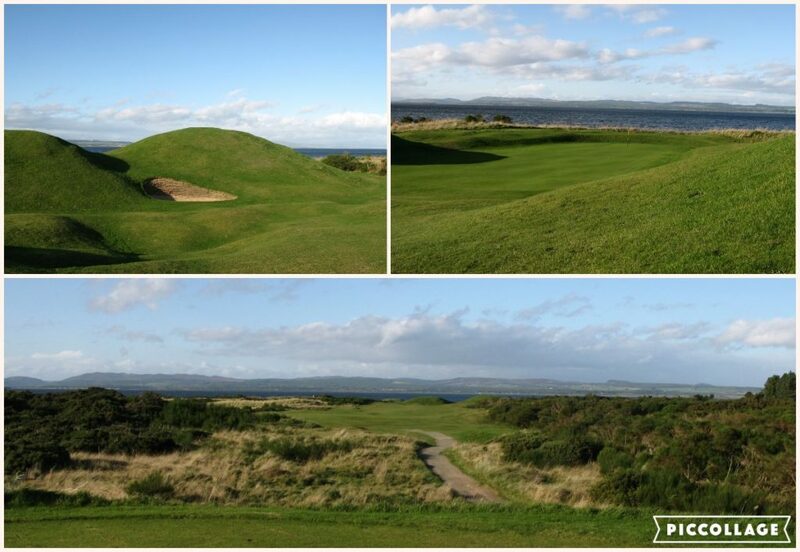 Old Tom Morris’ creation is a “must play” if you head North. Standing on the innocuous looking first tee at Tain, visitors will most likely think “is this it?”; fast forward 3 holes they may well be thinking “I can’t cope with this!” The second shot into the 1st is blind over a fenced road with a well placed green side bunker; the approach at the 2nd (SI 4) is also blind with a ditch and engulfing bunker awaiting; and the long par 4 3rd (SI 2) requires a drawing approach shot to have any chance of being close to a left sided or even centre pin – thankfully these holes are assisted by the prevailing wind! Given the old hickories and gutty balls used in 1890 when the course was opened, Old Tom must have been an incredible golfer. Welcome to Old Tom’s “Northern Jewel”. The signature 11th “Alps” – for obvious reasons! Tain is situated on the Dornoch Firth, 34 miles north of Inverness and 9 miles south of Dornoch. There is record of 6 holes existing from around 1870, prior to Old Tom Morris designing a 15 hole course which finally extended to 18 in 1894. Initially called St. Duthus Golf Club, after the patron saint of the town, the name evolved to “Tain” during the 1900s. 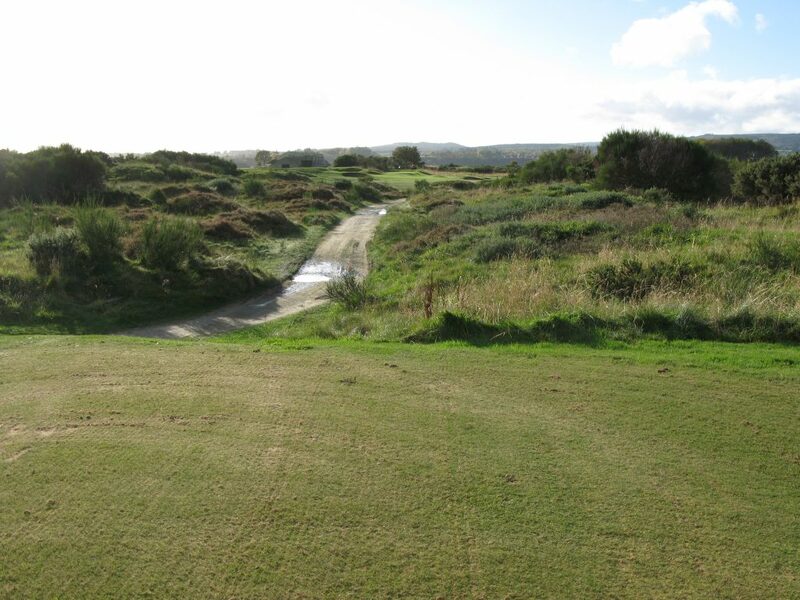 The difficult par 4 2nd hole, with this approach being blind for most average golfers – the ditch is deep! In assessing Tain’s layout, it’s interesting to consider the originality of the course design and what remains today. There are several detailed maps on the club’s excellent website – in truth, although the general layout remains similar, due to many adjustments and lengthening over the years, only a few holes, the present 9th (still playing to the original green), 10th, 14th and 15th, remain as Old Tom Morris designed them. In contrast, Bridge of Allen ,is almost untouched from Old Tom’s original design. 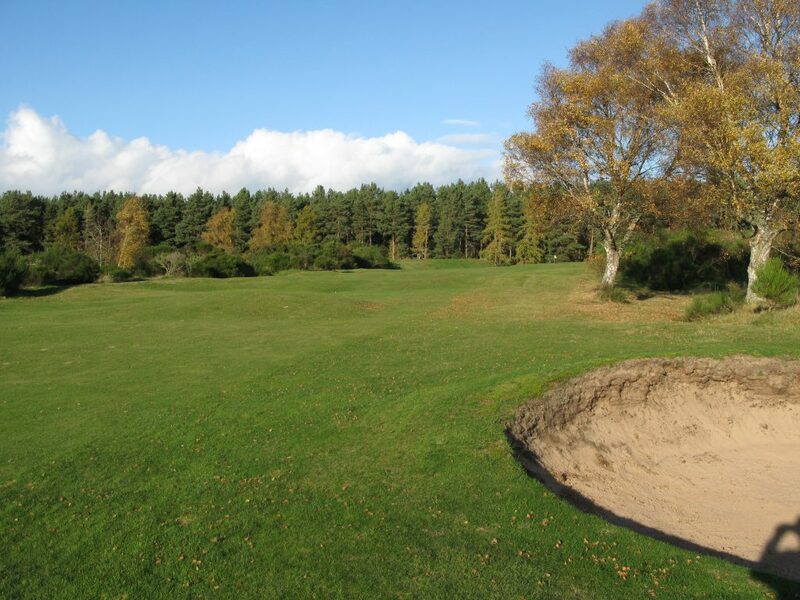 After the opening 3 holes, you are then faced with the long par 5 4th, actually a respite, then a mid iron par 3 5th, with deep pot bunkers, then turning partly back into the prevailing wind to play the par 4 6th hole, which worryingly has the name “Bunker”. By which time on the day I was 13 over par! After some holes that then feel more like highland golf (trees, turf, ‘feel’), the signature 11th hole, “Alps”, takes you closest to the shore, followed immediately by the aptly named “Glenmorangie”, 12th, with views to the distillery. 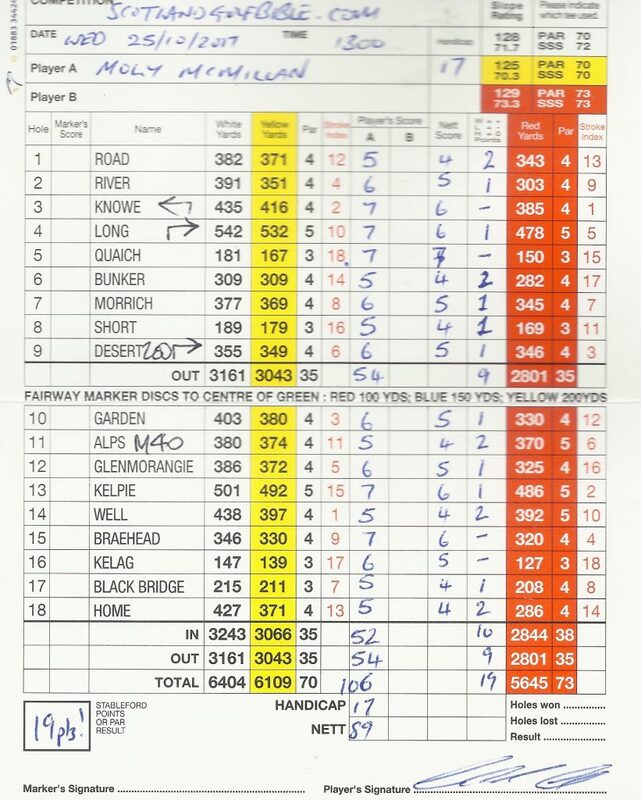 By which time, if you’ve still got a card going, beware the SI 1 14th, played into the prevailing wind, then an interesting pair of back to back par 3s, at 16 and 17, both with water in play. A typical well placed Tain bunker at the 8th. After a very friendly and helpful discussion before my game with the pro, Stuart Morrison, in the end I shot 106 (Aaagh), completely down to my very poor play, albeit the wind blew up to 30 mph. The course was in very good condition with play still on full tees and greens. It must be said that Tain has very many characteristics of a links course (layout, location, pot bunkers, hillocks) but the turf in many places is distinctly more arable and I suspect Tain will play longer in the summer months than the more harder fairwayed links courses. A more highland feel at the dog leg par 4 9th at Tain. 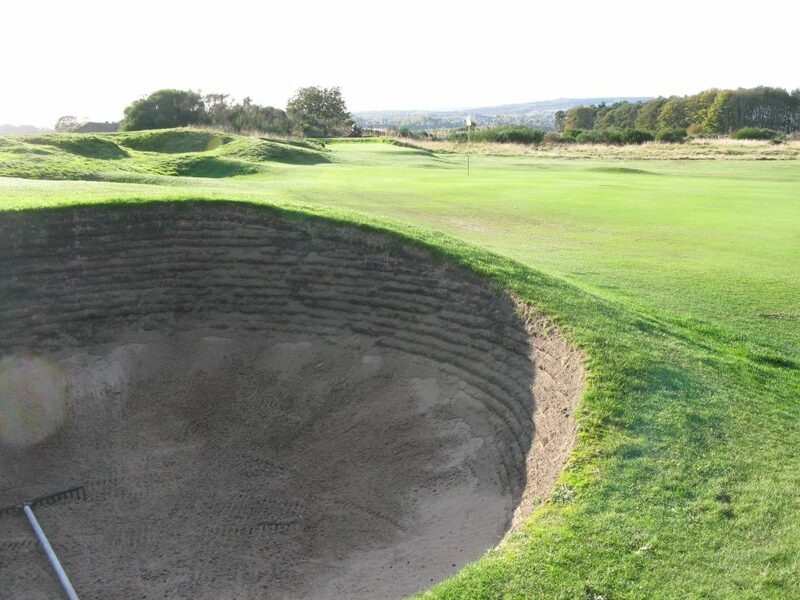 This is rightly regarded as a “must play” links course, and I would urge anyone venturing north to play Royal Dornoch, its more prestigious neighbour, to play Tain, which could be argued is better value. Moly’s 106 card at Tain! 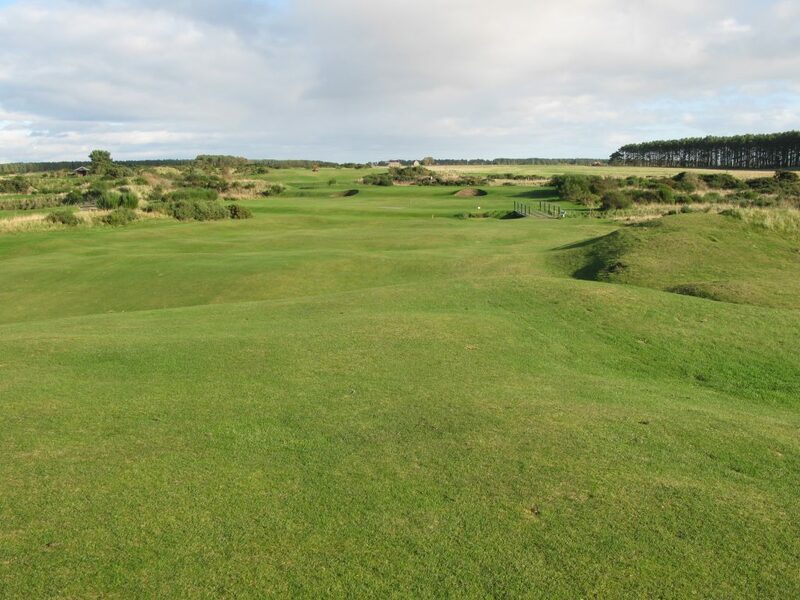 This entry was posted in 18 holes, 1851 - 1900, 4 star, 4.5 star, Course Architech, Course Owned By, Course Quality, Course Type, Holes, Links, Members, Old Tom Morris, Overall Value, Price, Region, The Highlands, When Course Established, £60 - £79. Bookmark the permalink.